This architect designed VILLA DELLE PALME, owner's holiday residence, is ideal if you want to stay away from commercial properties. In this Suite we can accommodate up to 8 guests and a total of 10 guests with additional beds. It includes up to 4 bedrooms (and a fifht bedroom if available) on two floors; 3 washrooms; living; dining; kitchen; fully furnished covered deck with exterior cooking facility, eating and barbecue and, of course, access to the subtropical garden, shared with the owners. Laundry deck is shared by the guests and the owners. Thank you do much for all your help to make our stay in Casteldaccia so memorable! The 'Attico' is so very comfortable and we felt very much at home during our 2 weeks here. We love the spiral staircase! P.S. Excuse my handwriting but I haven't written anything for 2 weeks and have nearly forgotten how! That's what 2 weeks of relaxation does to you!! thank you for a wonderful stay in your unique and beautiful apartment. It has made our trip to Sicily truly memorable. We have a great stay. Nice weather, nice apartment, nice sightseeing and very delicious food. We really enjoyed our holidays at your apartment in Casteldaccia! Sicily is so nice - even in November we had some sunny days and went to the sandy beaches of Cefalù and still took a bath in the sea. Love the clear water! We climbed on the Etna and also had a wonderful view from the top of the amphitheatre in Segesta. Besides we relaxed in the studio on the rainy days. I love to use the shower outside! We cooked a lot, too. The people of Casteldaccia were very friendly, even if they couldn't speak English - with the help of hands and feet (and a smile!) we always got along. It's a shame that we didn't get to know you two ( because you are in Canada right now)! Anyway, many, many thanks to Alessandra who did a great job! Wonderful week spent in the house for a family reunion. We had 4 children who had a great time playing in the garden. Great base for exploring the local area. 1 - Climbing 'La Rocca' at Cefalù - beautiful sea views, amazing sunset. 2 - Having a beach day(also at Cefalù) in November!!! Thank you for the very detailed instructions, very handy. fabulous holiday. Just wish it could have been longer. Never having been to Sicily before we did not know what to expect... Wow! Great people, great food, fantastic accommodations we love it here. Cefalù beaches, Agrigento ruins, Palermo all easy driving distance. Alessandra, Riccardo, Maria all ready and willing to help. We need to stay two weeks next time. Thank you for a great ten-day stay, which we've enjoyed enormously. great studio apartment, complemented by wonderful weather, excellent food & wine, & some lovely places to visit. We've not been adventurous, but have hopped on and off more trains & buses than we normally do in England. And have had a memorable holiday. We've really warmed up to Casteldaccia, & won't forget in a hurry the splendid celebrations for San Giuseppe. the fireworks were great; but the storm the next night was even louder & brighter! 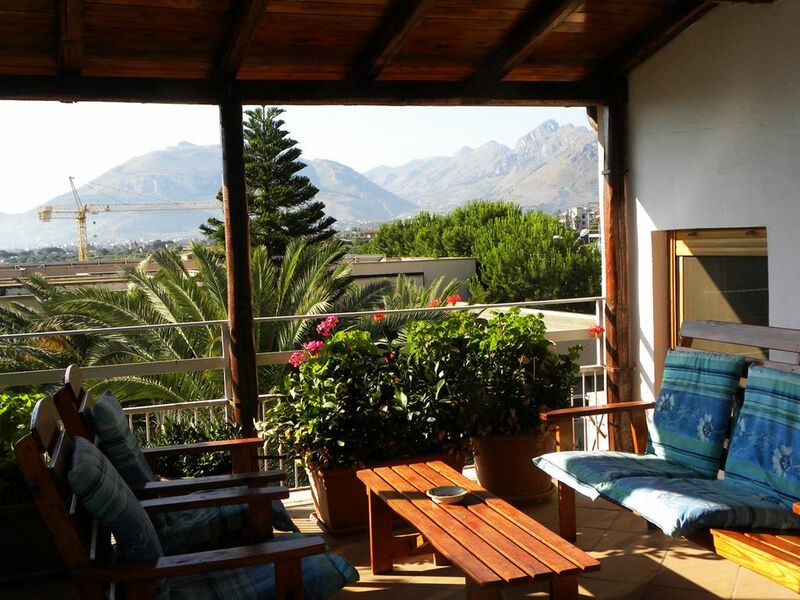 This Suite in Villa delle Palme has high ceilings, cable TV, stereo/ CD player, air conditioned on request. The kitchen is fully equipped with all you need for gourmet cooking and has a supply for your basic needs. It is furnished with love and care to the smallest detail and include dishwasher, fridge, four-burners stove with oven, microwave; all the utensils and basic supplies. Coal barbecue unit and exterior burners allow you to barbecue, griddle or deep fry on covered deck. In the house you will find fresh bed and shower linen as well as soaps for shower, dish, dishwasher and laundry. Clothes washer is available at no extra cost. We have provided you with a wall safe, should you wish to have extra protection for your jewels and valuables. The garden is reserved to guests of the Garden Suite, as well as the owners. Thank you so much for your fabulous review, it will go a long way! We stayed at Maria and Ricardo's Terrace Villa for two weeks in August. We have three sons ages 8,15 and 18 and there was plenty of space for all of us. The villa had everything we needed and was very clean. This is a beautiful property with lots of special artistic details. It has been lovingly renovated by the owners and was an absolute pleasure to stay in. This is not a tourist area and by going out every morning to the local shops we got to know the people despite not speaking a word of Italian! Maria and Ricardo advised us about all the best places to shop and eat. The restaurants are very reasonably priced and the food was fantastic. The beach is a short drive away and the tourist town of Cefalu is about a 25 minute drive. The train station is very close and for 2.50 you get a ticket to Palermo which is about a 30 minute journey. We have wonderful memories of our holiday especially the beautiful meal Maria and Ricardo cooked for us towards the end of our stay. The setting of this house is very special with fig, olive and fruit trees growing in the garden. My memory of this holiday will always be the smell of Jasmin as we climbed the stairs to our terrace every night. If you want a real Sicilian experience go to Casteldaccia . Sicily. amazing history, welcoming people! A super place to stay, informal and understated. our hosts were present when we were there... a bonus. Sicilian folk are welcoming and generous in their acceptance. Great accommodation and very handy for a popular beach and transport. You must do Pallermo on a Vespa! A very nice place to visit lots to see and do .Very difficult driving conditions in towns though. Really nice with a walled in garden and all the commodities. Very good relationship with the owners. Will recommend. My boyfriend and I stayed at Maria's Terrace Suite in June and it was a real treat ! The garden oasis is lovely and with it's lush greenery it really helped with the summer heat! The room was comfortable and very clean and all the details that Maria and her husband put in to the place really show their love for their home and land. I plan on visiting again soon as it's so easy to get around Siciliy from Casteldaccia. VILLA DELLE PALME is located in the heart of Casteldaccia, a quaint village on a Sicilian hill, two km from the sea and 20 min. easy drive to Palermo. The location offers a unique setting. Not isolated in the country, this villa is placed in the center of the town, melted among the town houses. You enter a portal and are placed in a magic intimate garden, while at the same time retain a taste of the local life, easy shopping and leisure walks. Excellent is the local production of wine. Don’t forget to taste the world renown 'Corvo, Duca di Salaparuta'. Freeway connection, located 200 meters away, will allow you to quickly connect, explore and discover remote areas of the island.